"When this legislation came into effect, the thinking then was that we need to control the spread of HIV by criminalising those who transmit it to partners willingly. 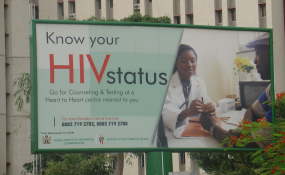 But the global thinking now is that that law stigmatises people living with HIV/AIDS and studies have shown that it does not produce the results that were intended. What the Ministry is going to do is to repeal that section of the law and ensure that we keep up to speed with modern trends in the world," said Minister Ziyambi. Asked on the timeframe when he envisaged to make amendments, Minister Ziyambi said: "I have acknowledged that we are going to do that and we are perhaps looking at introducing that amendment through the Marriages Amendment Bill that is to come. That is the fastest way to do it." Responding to another question, Minister Ziyambi said it was high time that Government promulgated a law that criminalised calling of sanctions against one's country. Buhera West legislator, Cde Soul Nzuma (Zanu-PF) had asked what Government policy regarding legislators that would go to Western capitals calling for sanctions against Zimbabwe. "That is a human rights issue. While we have no specific policy on that but probably it is high time we have a policy on that," said Minister Ziyambi.